Otome games are definitely outside of my comfort zone, but you know what? That is not necessarily a bad thing. After playing Hatoful Boyfriend, I was left wanting more. Today, I’m here to talk about Hakuoki(薄桜鬼) which translates to “Demon of the Fleeting Blossom.” Now we have already spoken about Hakuoki on the 3DS and the PlayStation 3, but what about Hakuoki on the droid? If you go on the Google Play store and search for it, you will find that there is a premium and a free edition. I am reviewing the premium one. 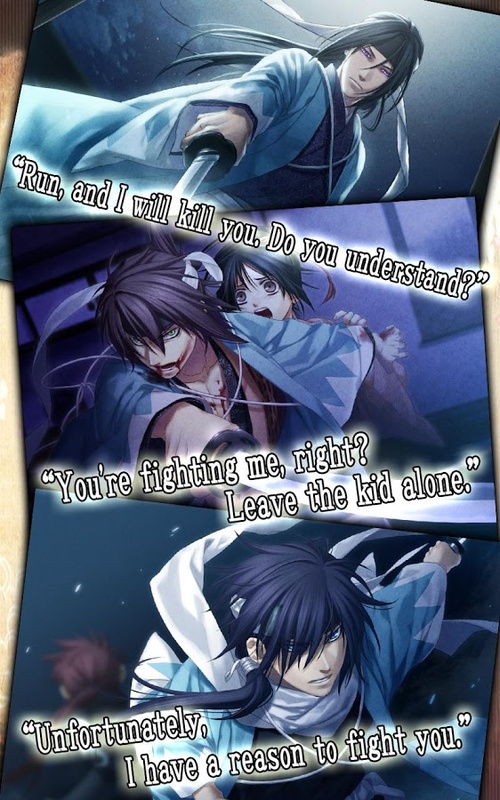 Hakuoki follows Chizuru Yukimura, who is in Kyoto on a quest to look for her father. The area she winds up in is filled with men who, to put it lightly, will not treat a lady in the most gentlemanly way. So she decides to dress up like a young boy and fool everyone! Eventually she comes across the Shinsengumi, a special force organized by the government. 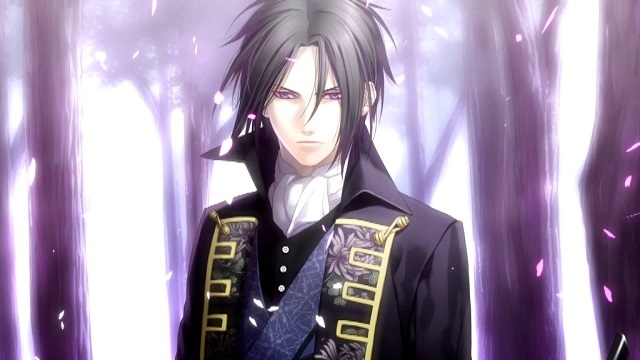 It is at this point you realize that Hakuoki is not a happy-go-lucky senpai-niichan-desu-love-story-funfest. There is lots of violence and some fairly tense moments. 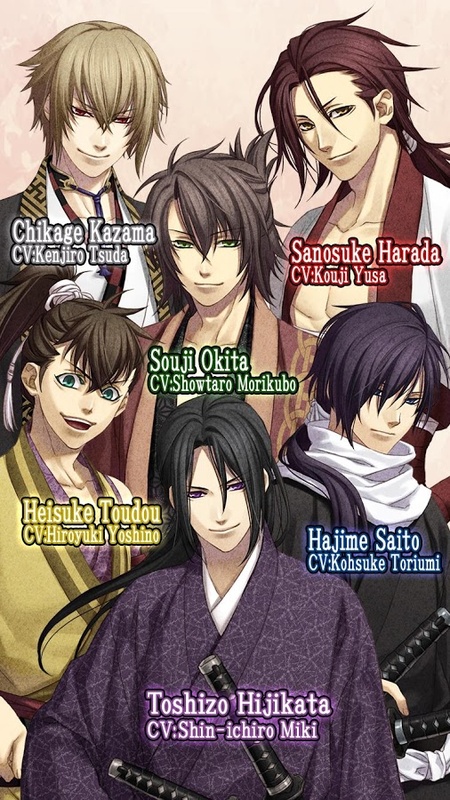 In any case, you end up staying with the Shinsengumi and get a chance to get to know them better. This is where the dating sim-esque elements come into play. Throughout the game you are given choices which will affect your affinity for various characters you meet and potentially your ending. As for the characters themselves, they are a really fun bunch. My favorite character was Okita Souji who kind of reminds me of Okita Sougo from Gintama. Well it should after all, they are both based off Okita Souji, the captain of the first unit of the Shinsengumi in real life. Actually, Gintama features a few of the Shinsengumi members and I found it particularly interesting to compare and contrast the characters they had in common. So, if you are a fan of Gintama, you will definitely get a kick out of these characters, and if you played Hakuoki first, check out Gintama. 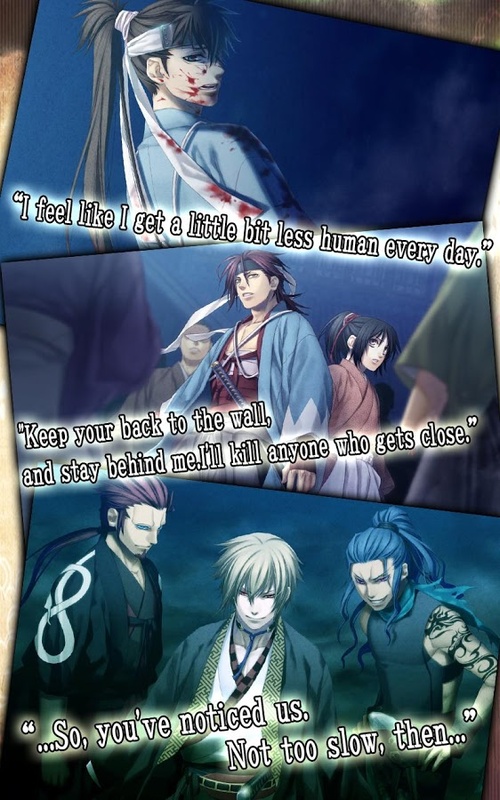 There is quite a bit to see and do in Hakuoki, and getting everything can take you a solid 20 or so hours. However, this game is not too cheap. It currently costs $27.99, but there is a free version for those of you who want to try it out before purchasing. Otherwise, Hakuoki is also available on the PSP, both in physical format or via the PSN (playable on Vita). 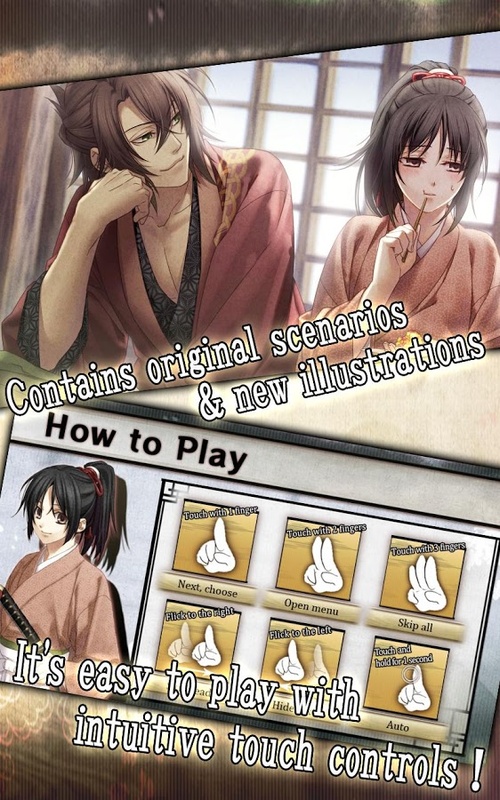 If you like the artwork and do not own any of those handhelds but want Hakuoki on your phone or tablet, check it out.